Peachtree Publishing Company, 9781561458448, 180pp. The inspiring story of one of the greatest moments in civil rights history seen through the eyes of four young people at the center of the action. The 1963 Birmingham Children's March was a turning point in American history. In the streets of Birmingham, Alabama, the fight for civil rights lay in the hands of children like Audrey Hendricks, Wash Booker, James Stewart, and Arnetta Streeter. We've Got a Job tells the little-known story of the 4,000 black elementary, middle, and high school students who voluntarily went to jail between May 2 and May 11, 1963. The children succeeded --where adults had failed--in desegregating one of the most racially violent cities in America. 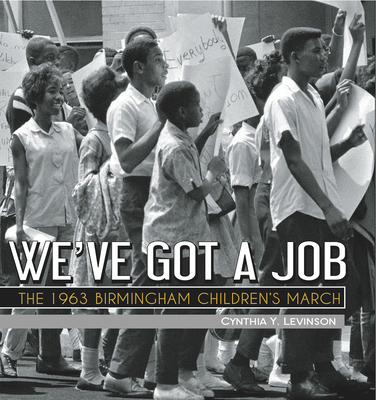 By combining in-depth, one-on-one interviews and extensive research, author Cynthia Levinson recreates the events of the Birmingham Children's March from a new and very personal perspective.